Inspirational Quotes on Happiness!!! When you are happy inside, I am certain you will be happy outside too. Which means that happiness doesn’t come from outside things, instead, from within you. Hopefully, now the question arises, well how to be happy inside?. I will try to brief it in few words here. Some define, happiness is, to have a high paying job with less stress, an outstanding bungalow in a prime location, a gorgeous wife, and beautiful children. But there are people who don’t own any of these and are still happy than you and me. Why? because they are happy with what they have. They don’t aim for what is not in their hands. Finally being satisfied is what makes one happy. This is what is life's purpose, “Be satisfied and give to the needy if you have more to share happiness”. Believe me, giving makes you happy, happier, and happiest which no money can buy. Here in this blog post, we have shared few splendid collection of inspirational quotes on happiness. Hope this quotes, would enlighten you even more on how to be happy and balance life in all situations. 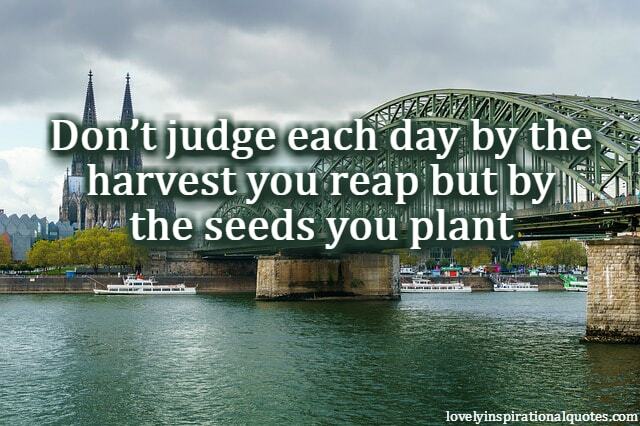 Don’t judge each day by the harvest you reap but by the seeds you plant – Robert Louis Stevenson. Remember that the happiest people are not those getting more, but those giving more. - H. Jackson Brown, Jr.
People take different roads seeking fulfillment and happiness. Just because they're not on your road doesn't mean they've gotten lost. - H. Jackson Brown, Jr.